A new ranking of publiclytraded companies identifies which ones are making clean energy a priority, both through revenue and through socially responsible decision-making. The list, which is updated every six months, has been expanded to include new sectors, which means some surprise names came out on top of the list. While there is no index that has been created based on this list, you may want to keep these names in mind when evaluating your holdings. You're concerned about climate change. But chances are, you don't know what's really in your investment portfolio and whether your investments are helping or hurting the cause. A new ranking is working to help change that. As You Sow, a nonprofit foundation, has teamed up with Corporate Knights, a research and financial information products company, to rank 200 companies by how well they are making clean energy a priority. That includes how much in revenue they receive through clean energy. It also screens out companies based on other criteria, such as whether they are involved with non-green utilities, tropical deforestation, child labor or weapons. Now other kinds of companies qualify, including food and apparel, real estate and banks. As a result, 78 companies made the list for the first time. 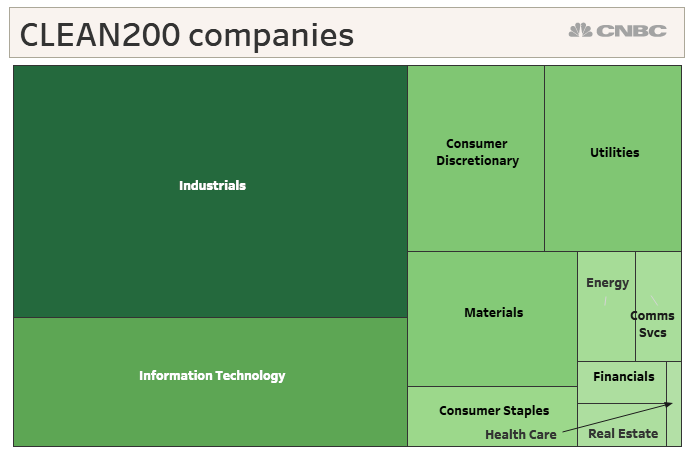 Most of the businesses are in the industrials sector, with 78 companies, followed by information technology (40) and utilities and consumer discretionary, which each had 20. Those that made the list were predominantly based in China, which had 36 companies, followed by the U.S. with 34 and Japan with 19. The new methodology cleared the way for Alphabet, Google's parent company, to debut in the top spot. That company was also judged on privacy, for which it received a grade of D minus. "They got the best grade out of anybody," As You Sow CEO Andrew Behar said. No one has created an index out of the list yet. But investors who are concerned about the environment can take cues from the ranking on what to invest in. "It actually performs quite well," Behar said. Following is a list of the top 10 companies and what they are doing in clean energy to stand out. The Brazilian bank provides financing for green buildings, renewable energy and sustainable agriculture, among other projects. The U.K.-based consumer staples company has 26 brands that are 100 percent sustainably sourced from agricultural raw materials. Some of those names include Dove, Hellmann's, Knorr, Lipton, Sunlight, Sunsilk and Vaseline. With its 5G products, Swedish information technology company Ericsson is striving to provide 10 times more energy efficiency than other companies' 4G products. Swiss industrials company ABB is working in the areas of renewables, energy efficiency and public transportation. Some of its products include solar inverters and high-efficiency motors. The Taiwan-based information technology company offers low-energy microchip products that are used in consumer electronics applications. The information technology company's energy-efficient equipment and hardware includes printers made from recycled plastic, as well as services to keep existing printing equipment working longer. The information technology company emphasizes energy-efficient equipment and hardware, notably its EnergyStar products and technology. The Japanese automotive manufacturer has distinguished itself in the areas of hybrid, electric and fuel-cell vehicles. In 2017 the company sold 1.52 million of those automobiles out of 8.96 million total. The German industrials company has set itself apart by creating business divisions that are specifically dedicated to energy efficiency and renewables. That includes areas such as smart grids, automated energy management technology and public transportation. The parent company of Google is fully powered by renewable energy. Of note, it has purchased 3 gigawatts of wind and solar capacity to match its global operation's energy consumption.